MOMIX is just one reason to take advantage of NYC during the heated days in the city that never sleeps. While many city dwellers head out to the beaches, mountains and bucolic parts outside of Manhattan, I remain in the metropolis and recently took my dear friend, Sidney Grant (Founder and Artistic Director of BALLROOM BASIX) to see a performance at The Joyce Theatre. 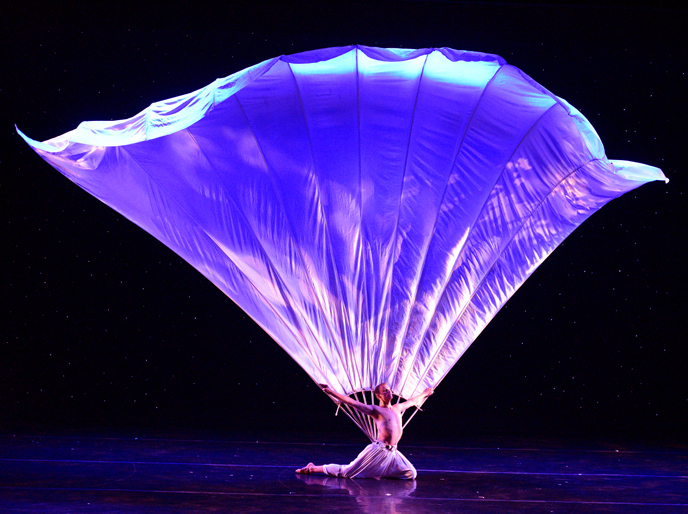 MOMIX is the continuing brainstorm and creation of Moses Pendleton. He is not only the creator but also artistic director of this troupe who have been seen in 55 countries for over 38 years. This month’s compilation of dances include signature props, inventive lighting, shadow and projections but above all, the extreme athleticism of professional dancers. As a spectator, it’s breathtakingly beautiful and mesmerizing. There are few words to describe the exact precision and visual stimulation that only live theatre can provide. In simpler terms, live theatre cannot be compared to video games, TV shows or Anime. This is a great time to unplug your devices and experience something real and organic. The Man Fan is performed by Jonathan Eden, with music by Azam Ali, AJ Ondas — Portals of Grace. This magnificent prop created by Michael Curry sweeps across the stage on the back of the talented dancer — the story melds together strength and kindness as the heavy fan encapsulates everything male – masculinity but with a gentle touch. Gasps are heard from the audience as the performer glides and attacks the stage. The Marigolds enter like sea sponges – fluffy fabric in vivid colors line up in a row of five. They are hard to detect as human at first. The illusion continues as the buds become flowers and their attire slowly transforms into beautiful dresses that the dancers show off in skirts and eventually full-length ball gowns. There are amazing transitions here with music by Suphala and U-zig Michael Paradinas. Performed by Jason Williams, Table Talk is a magnificent feat. This piece with the song Safe From Harm demonstrates the incredible power of the human condition and body. Mr. Williams takes this dance to a new level with strength, agility, balance and humor. The final outcome tells a memorable story about pushing the limits -– he dances with and controls the table like a matador. Aqua Flora is performed by Jennifer Chicheportiche. This vignette is amazingly complex as she turns over a 100 times with strands of beads that first compose a costume and end up as her headdress. The turning to keep the prop on her head is breathtaking and the timing is intoxicating enough to create motion sickness. Paper Trails, is performed by the entire troupe. The stage is electrified with hieroglyphics, then the alphabet, words and scribble that communicate in multiple languages. 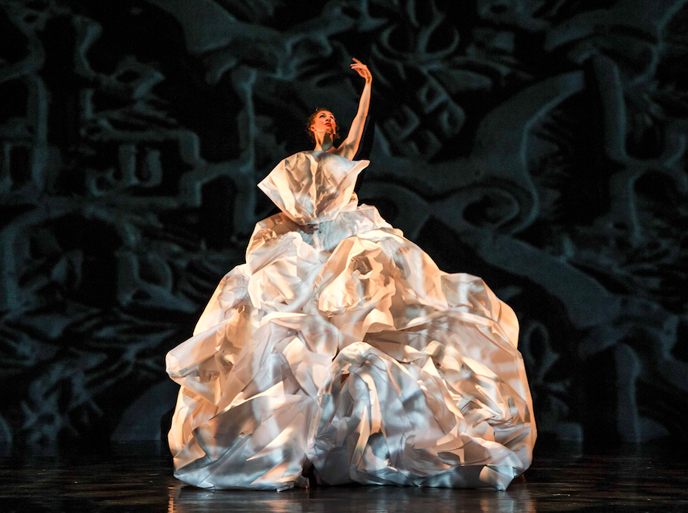 The dancers mix up the multi-medium spectacle and eventually construct a wedding dress (above). The entire performance is made out of paper with lighting, dance and illusion. Sidney and I left The Joyce Theatre on cloud nine and man fans of MOMIX. This is just one reason why it’s good to stay in the city during the balmy days of summer. 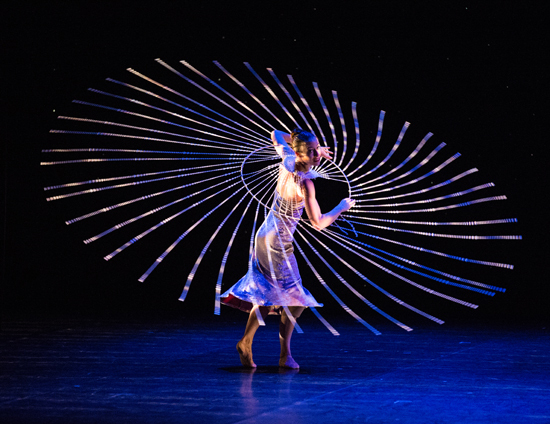 MOMIX is performing until August 12th. Photos by: Charles Azzupardi, Max Pucciarello, Eddy Fernandez and P.K. Greenfield. Kudos to the performers: Anthony Bocconi, Jennifer Chicheportiche, Simona di Tucci, Jonatthan Eden, Sarah Nachbauer, Heather Magee Spilka, Jake Stainback, Jocelyn Wallace, Jason Williams. And lighting design by Howell Binkley, Bruce Goldstein, Joshua Starbuck, Woodrow, Michael Korsch, and Moses Pendleton. Tags: Momix, The Joyce, Dance, Moses Pendleton, NYC. Read City Pulse to learn insider tips on what’s happening in and around NYC. Tags: MOMIX, Dance, The Joyce, Chelsea, Illusion, Moses Pendleton. P.K. Greenfield is a freelance writer for several publications including Millennium Magazine, Passport, i-Italy and The Wall Street Journal.